Mesotherapy is a technique used to treat a variety of scalp conditions, with the most common conditions being diffused thinning hair experienced by women, male pattern balding and hair loss through stress.It is also suitable for conditions such as psoriasis of the scalp, oily hair and dandruff among other conditions. 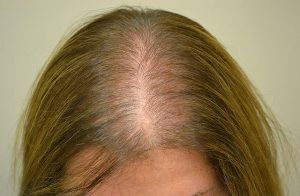 The technique involves either tiny injections placed superficially, or a needle-free device used to penetrate small doses of Mesotherapy solutions into the scalp. The treatment can be performed as a preventative measure or used to help correct a specific condition. The treatment is generally not painful and will usually take between 30 and 60 minutes, dependant on the condition and its severity. The most important factor of the treatment is the Mesotherapy solution used and skill of the Mesotherapist to blend or use a cocktail of pharma grade ingredients from a reputable brand that will treat your specific condition. Here at The Hub New Mills I use an innovative safe and highly effective brand called Fusion Meso. I am a highly experienced Mesotherapy practitioner and a registered stockist, trained to the level of Meso Specialist Advanced Practitioner, having studied Mesotherapy and the Fusion Meso brand in depth. The Fusion Meso hair or scalp treatment that you will undertake will be tailor made to your individual condition. If hair loss is your concern, I will concentrate of increasing the level of nutrients and oxygen in your scalp, which will naturally feed the follicles and strengthen the hair shaft, this will increase the thickness and volume of the hair and generate new growth from dormant follicles before they disappear. The treatment schedule is different for each person, however a minimum of 6 treatments is required, one per week for six weeks for best results over a course of treatments, with a maintenance treatment being performed every 4-6 weeks initially and then every 6-8 weeks. The initial course we class as impact therapy or intensive therapy, with stage two designed to maintain growth, prevent loss or to a previous condition returning. Throughout your treatment plan we will monitor the changes and success, with images being taken to allow you to see the difference in your specific condition as the course progresses. A personalised lotion is optional and can be made for you to use at home between treatments and will contain professional strength pharma grade mesotherapy ingredients. This lotion will provide a daily dose of nutrition which will enhance your overall results. Androgenetic alopecia is a com mon form of hair loss in both men and women. 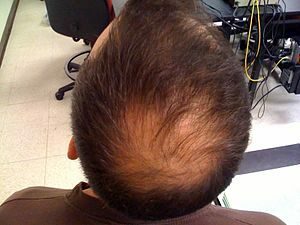 In men, this condition is also known as male-pattern baldness. Hair is lost in a well-defined pattern, beginning above both temples. Over time, the hairline recedes to form a characteristic “M” shape. Hair also thins at the crown (near the top of the head), often progressing to partial or complete baldness. Alopecia areata is an autoimmune condition where your own body’s immune cells attack hair follicles. 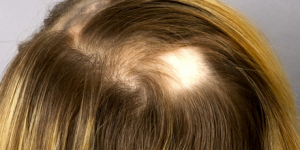 Most often, this leads to oval shaped patches of complete hair loss. This can affect any hair-bearing region of the body, including eyebrows/lashes and body hair. Alopecia areata is unpredictable—it can go away on its own, or it can expand to involve all the hair on the body. Dermatologists see this condition frequently, and often treat it with injections of steroids into the areas without hair in order to decrease the autoimmune reaction. By targeting specific areas on the scalp, Mesotherapy’s bespoke blend of vitamins and minerals works to restore hair growth on the existing hair follicles. It can help to increase microcirculation and replenish the hair follicles with valuable nutrients to promote hair growth for healthier, thicker and fuller looking hair. HAIR MEN, a hair mesotherapy product with growth factors and peptides for male androgenic alopecia. 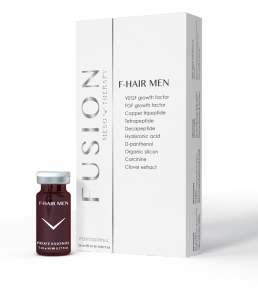 F-HAIR MEN is an effective mesotherapy product containing growth factors and peptides to achieve the best results in the shortest time against male androgenic alopecia and hair loss. Hair loss (alopecia) is a common problem affecting both men and women. The most common being androgenetic alopecia (AGA) which represent 95% of all hair loss. At the base of the follicle is the dermal papilla and extra cellular matrix (ECM). As papilla & ECM new cells grow, they push the existing cells upwards to form the hair. The dermal papilla plays a crucial role in the dermal / epidermal interactions and is of great importance for the hair formation and growth cycle. F-HAIR MEN is an exclusive product that effectively treats alopecia, and is formulated with a blend of peptides, growth factors, organic silicium, pantenol and hyaluronic acid. It restores an effective micro-circulation of the scalp and revitalises hair follicles. It is an effective formula designed to fight thinning hairs, stimulate regrowth, stop men androgenic alopecia and hair loss. A course of treatments is required for best results.